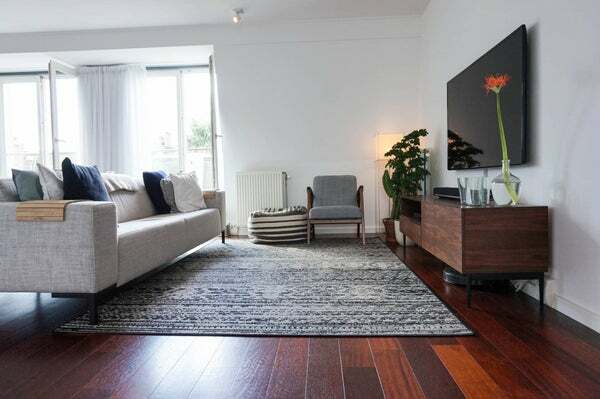 Fully furnished modern and bright luxurious apartment in the Staatsliedenbuurt next to Westerpark. The apartment is located on the fourth and top floor. The living room is across the entire width of the apartment and has two double doors with French balconies facing south. The apartment is located in the small residential complex De Mokumer built in 2005. Machiel Spaan of architectural company M3H provided the design for De Mokumer. The complex fits perfectly with the style of the older buildings in the neighborhood. In the concrete of the windowsills are the names of the residents who have lived in the former residential block in 1912. A nice way to connect the past with the present. For an additional 150 EUR you can rent a parking spot in the garage underneath. Through the well maintained communal entrance and staircase you reach the apartment on the fourth and top floor. The living room is at the front over the entire width of the apartment and has two French balconies with patio doors facing south. The modern open kitchen is equipped with all necessary appliances. Through the kitchen you reach the office/dining space at the rear of the apartment with a large skylight that can be opened and a French balcony with patio doors. The living area is very bright because of the open connection between the living room and the office/dining room with large skylight and windows at the front and at the back of the house as well! The hallway provides access to the separate toilet and the bathroom. The modern bathroom has a bath, separate shower and a sink. In the hall is also the practical storage room with connection for the washing machine, and the central heating system and mechanical ventilation. The spacious bedroom is at the rear of the house. The Van Beuningenstraat is located in the popular Staatsliedenbuurt, close by the Westerpark. This beautiful area is known for the authentic Amsterdam atmosphere, and the amount and variety of facilities. Within walking distance are many cozy restaurants, lunchrooms, playgrounds, schools, kindergartens, supermarkets, sports facilities, cafes and shops. The popular cafés Amsterdam and Nassau are located around the corner and the shopping street Haarlemmerdijk and the Jordaan are also nearby. And of course the cultural Westergasfabriek, with a variety of activities within just minutes by foot. There are many good public transport options to the centre and Central Station & Sloterdijk Station, and the A10 freeway is easily accessible.